A transparent plastic growth chamber bound for the International Space Station on the SpaceX-3 resupply mission may help expand in-orbit food production capabilities, and offer astronauts fresh produce. NASA’s Veg-01 experiment will be used to study the in-orbit function and performance of a new expandable plant growth facility called Veggie. 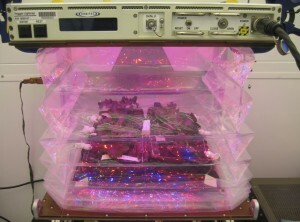 Veggie is a low-cost plant growth chamber that uses a flat-panel light bank that includes red, blue and green LEDs for plant growth and crew observation. Veggie’s unique design is collapsible for transport and storage and expandable up to a foot and a half as plants grow inside it. The roots and nutrients for the plant are contained in plant “pillows”. The investigation will focus on the growth and development of “Outredgeous” lettuce seedlings in the microgravity environment. Orbital Technologies Corporation (ORBITEC) in Madison, Wis., developed Veggie through a Small Business Innovative Research Program. NASA and ORBITEC engineers and collaborators at NASA’s Kennedy Space Center in Florida worked to get the unit’s hardware flight-certified for use on the space station. As NASA moves toward long-duration exploration missions, Massa hopes that Veggie will be a resource for crew food growth and consumption. 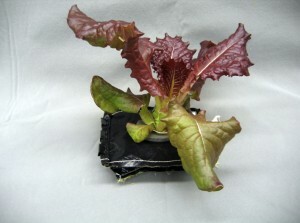 It also could be used by astronauts for recreational gardening activities during long-duration space missions. The system may have implications for improving growth and biomass production on Earth, thus benefiting the average citizen. Plants have been grown in space before, but there never has been a system that has regularly provided a supply of produce to astronauts, not even in small quantities. According to a NASA source, part of the problem is that ISS cabin level CO2 levels are excessively high for plants to survive, despite that plants convert CO2 to oxygen. Another problem may be that cabin humidity is too low. Interestingly, the Orbitec system not only protects plants from the cabin atmosphere (via the collapsible transparent plastic chamber), but it also isolates the plant roots in a second envelope of plastic. Orbitec sells a low-tech version of this space garden for terrestrial experimentation, which may be suitable for school science faire projects.